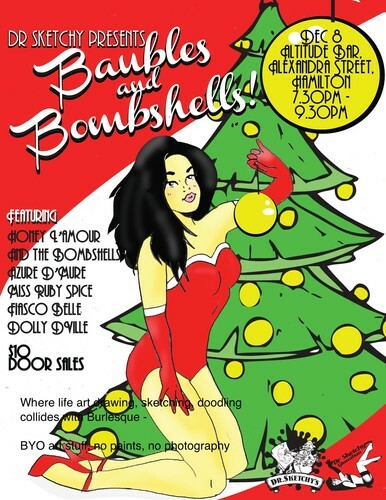 Dr Sketchy Hamilton branch is getting ready for Christmas with "Baubles & Bombshells". Come along and listen to two awesome local singer/burleyQ performers, yes not one but two chanteuses. Headlining this session is the fabulous bubbly blonde bombshell Honey L'Amour, fancy a little opera with a twist then Fiasco Belle will tickle yer fancy. And of course the other glorious burley bombshells, Dolly D'Ville, Azure D'Murre, & Miss Ruby Spice. Get along to Altitude Bar, Alexandra St, Glamilton. Be sure to bring yer art supplies, no paint and no photography. 7.30pm - 9.30pm, door open 7pm. Good times, prizes, gorgeous gals up close to be drawn and sketched.